From individual items, through to excellent value “all-in” furnishing packs for your Bulgarian property, we work directly with one of Bulgaria’s best furnishing suppliers to quickly and effortlessly make your apartment or villa in Bulgaria ready for your family or your first rental guests to stay in. Prices for complete Bulgarian furniture packs start from Ђ3500. Many people worry about the security of their property while it is left empty, and rental guests often appreciate the reassurance of setting the alarm when they go out for the day. We can arrange for an alarm to be professionally fitted, and can set up a contract with the local police or SOT security company to monitor the alarm. Generally SOT security firms will only honor their contracts when you have a local key-holder available if the alarm sounds or signals any malfunction, so we will register by Power of Attorney as their first point of call. We can also set up your insurance for buildings, contents and public liability insurance in Bulgaria. Many of our clients experienced a bad service from their estate agents when they first purchased their Bulgarian property. Our management team automatically make a standard check of your property deeds and documents and our expert civil and property lawyers will always be able to put your mind at rest over any issues. 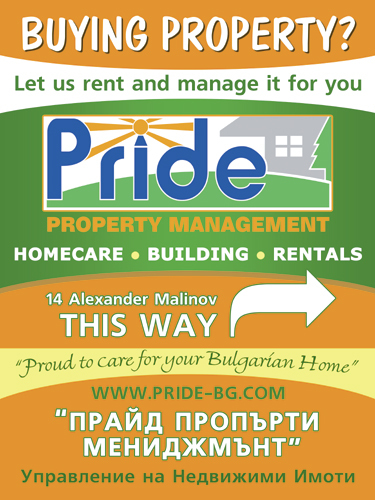 If you decide to purchase further property with Pride Property Services, our Bulgarian solicitors in Varna and Dobrich services for purchases are free to existing Pride Property Management contract holders. Our cleaning team are all very experienced and have generally worked with larger hotels or a cleaning company in Varna before joining us. We train our Bulgarian cleaners in our required presentation standards, so that your property looks at its peak when you or your guests arrive. Our laundry service includes professional machine pressing of sheets and towels, and first impressions really do count. As standard we clean again during stays of 9 or more days and again when the property is vacated. We offer a very fast rental changeover service. We will do everything we can to arrange exactly the type of garden you want. We can landscape with borders and beds, plant fruit trees and vines (which rental guests love), install automatic irrigation or pave and shingle areas to reduce ongoing maintenance. Our gardeners visit regularly to cut grass, sweep leaves, weed and keep everything looking perfect! Outdoor areas are often those which potential renters will see in photos first, so it is important to make the right impression. We want your guests to relax from the minute they step off the plane or arrive in the country, so we meet all our rental guests at the airport or other convenient point if they are driving. They will be met by a well-presented, English-speaking Pride full time employee who is familiar with your property, and transferred in a clean air conditioned car, minibus or coach. Our staff will explain how everything works at the property as well as answering any questions before taking a security deposit and leaving the guests to enjoy their stay.